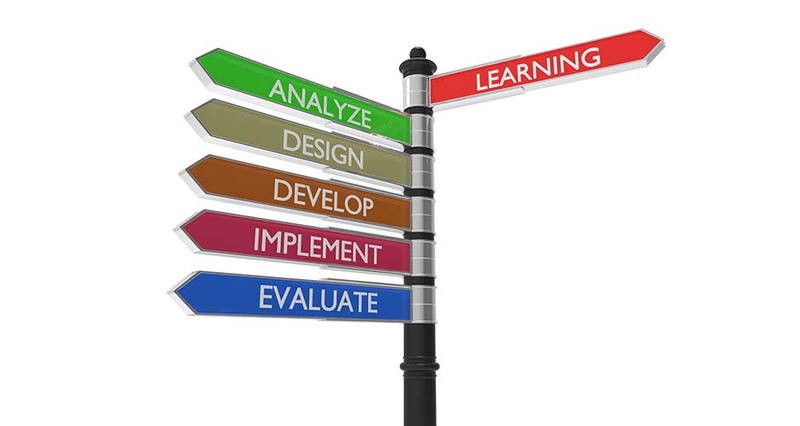 The ADDIE model is a systematic instructional design model consisting of five phases: (1) Analysis, (2) Design, (3) Development, (4) Implementation, and (5) Evaluation. Various flavors and versions of the ADDIE model exist making use of a vertical approach. This leads to more flexibility within the model compared to its original linear form. Identify the instructional problem, define the instructional goals and established objectives, determine the learning environment and take the learner’s existing knowledge and skills into consideration. What is the desired new behavioral outcome? What are the Adult Learning Theory considerations? Apply instructional strategies according to the intended behavioral outcomes by domain (cognitive, affective, and psychomotor). Create and assemble the content assets that were blueprinted in the design phase. In this phase, storyboards and graphics are designed. If eLearning is involved, develop and/or integrate the technologies as well as performing debugging procedures. The project is reviewed and revised according to the feedback received. During the Implementation Phase, put the plan into action and develop a procedure for training the learners and teachers. Materials are delivered or distributed to the learner group. After delivery, the effectiveness of the training materials is evaluated. The Evaluation Phase consists of (1) formative and (2) summative evaluation. Formative evaluation is present in each stage of the ADDIE process. Formative assessment is typically contrasted with summative assessment. The former supports teachers and students in decision-making during educational and learning processes, while the latter occurs at the end of a learning unit and determines if the content being taught was retained. Ainsworth p. 23 (2006). Summative evaluation consists of tests designed for criterion-related referenced items and providing opportunities for feedback from the users. Uses for example, Rapid prototyping (continual feedback) as a way to improve the generic ADDIE model and will make revisions if necessary.